Hi Def named as one of Best Wedding vendors for 2017 by LIWeddings.com!!!! Subject: Congratulations! You have won LIWeddings.com Best of 2017! 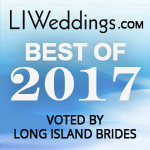 > We are pleased to let you know that you have been named as one of LIWeddings.com Best of 2017 wedding vendors! Your votes came directly from the brides and are something to be very proud of. We thank you for providing your outstanding services to LIWeddings brides. We have attached a Best of 2017 logo you are more than welcome to use on your website, email, Facebook, Twitter, Instagram, etc. I included a larger and smaller version so you can use either depending on where you are posting. Below is the HTML code to include the graphic on your website, showing your accomplishment and directing brides to your full page ad on the site. We are so honored that our brides have voted for us! Thank you to all our past brides, and cheers to the new ones on their upcoming weddings!